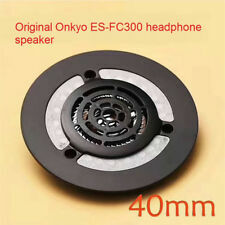 This speaker include original front cover, if you want to DIY your headphone with this speaker, you need to disassemble the speaker yourself. Wide-Range Titanium Drivers - The Onkyo ES-FC300s feature 40 mm full-range titanium drivers encased in a solid aluminum housings. Hybrider Standby-Modus für Video- und Netzwerkverbindungen bei ausgeschaltetem Gerät. Farblich codierte, für Bananenstecker geeignete Lautsprecheranschlüsse. Farbe: Silber. Bild-in-Bild-Vorschau mit InstaPrevue™-Technologie. If you mind this. Colour: As Shown. Type: CD Remote. sign after receiving. such as broken, scratched and so on. Condition: New. Unterstützt Blu-ray 3D-Wiedergabe (bei Anschluss an einen 3D-kompatiblen Fernseher). Ausgänge: HDMI vergoldet, Audio analog, Audio digital (nur koaxial) und Video analog. Unabhängige Schaltungsbereiche für Audiosignale sowie digitale und analoge Videosignale zur Reduzierung elektromagnetischer Störungen. Remote uses 2AA batteries not included. Remotes have been tested and work perfect. This remote is in excellent pre-owned condition. Tested and works great. These batteries are rated at 10 years for standby. Ours is an genuine original Onkyo remote. Remote uses 2AA batteries not included. Remotes have been tested and work perfect. Remote uses 2AA not included. Remote uses 1x CR2025 battery included. Remotes have been tested and work perfect. We hope you understand. Remote has scuffs and scratches. Works with Model#. We are very accommodating and will be more than happy to fix any problem. This is NOT an original unit, but a reproduction using cutting edge 3D Printing technology. The gear is held onto it's shaft by a simple, yet small C-clip. You do not need tons.just enough to sufficiently coat it. ONKYO Integra P-306R Stereo Preamplifier W/ Original Box In VG Condition. PRODUCT SPECIFICATIONS. Want to see more products?. Ours is an genuine original Onkyo remote. Remote uses 2AA batteries not included. Remotes have been tested and work perfect. Remotes uses two AA batteries not included. Onkyo DVD Player Excellent pre-owned condition. Tested and works great. Last picture shows a dvd playing. See all pictures as part of the description. Tragus shield block only the entrance of the ear canal slowly developed new shape earpiece. Put on the ear the ear hanger, fit the ear shape can be adjusted. Adopt a shell housing as well as the ear fit in the recess at the top of the ear (Simba). Will this part fit other turntables?. I can only verify that it fits the 1057F. You can use this part at your own risk in other systems. This is NOT an original unit, but a reproduction using cutting edge 3D Printing technology. ONKYO speaker system D-55EX Japan. [Accessories] Body · speaker amplifier · with instructions. There is no big crack on this speaker, it is beautiful. Asia, Middle East. Even if you think to yourself, "But the item I want is only available in Japan.". Very good working condition. Minor scratches. No batteries. ONKYO TX-SR606 HDMI PCB BOARD. PART#1B211573-1A. 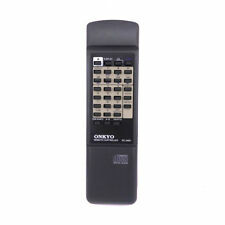 Onkyo RC-515M DVD Remote Control for TX-SR601, TX-SR701, TX-SR601E, TX-SR701E . Excellent working used condition. Everything functions as it should and it doesn't have any corrosion or major wear showing on the remote. Very minimum wear. Comes from a smoke and pet free environment. Batteries not included. Tracking information will be up instantly upon receipt of the payment and Shipped with USPS First Class Package. Thanks for looking God bless. Up for sale is a very nice Onkyo Integra P-304 preamplifier in excellent condition. Weight: 7.8kg. Output: 150mV (line), 1V (Pre out), 6V (Pre out Max). All inputs, outputs, buttons and power outlet have been tested and are in working condition. Supports DSD 5.6 MHz native playback (via network / USB). Supports playback of WAV / FLAC 192 kHz / 24 bit file etc. high resolution sound source. Gapless playback for realizing more natural music playback (USB playback).